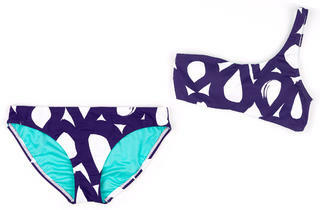 Shop our top picks for bikini bathing suits for summer 2013, in many different styles and price ranges. Whether you plan to beat the heat this summer at one of Los Angeles' pool parties or nearby beaches, or escape for a weekend getaway, we found the best new bikinis to wear for summer 2013. You’ll find high-waisted cutout styles from Topshop, two-in-one reversible options from Aéropostale and full-coverage tankinis from Old Navy.